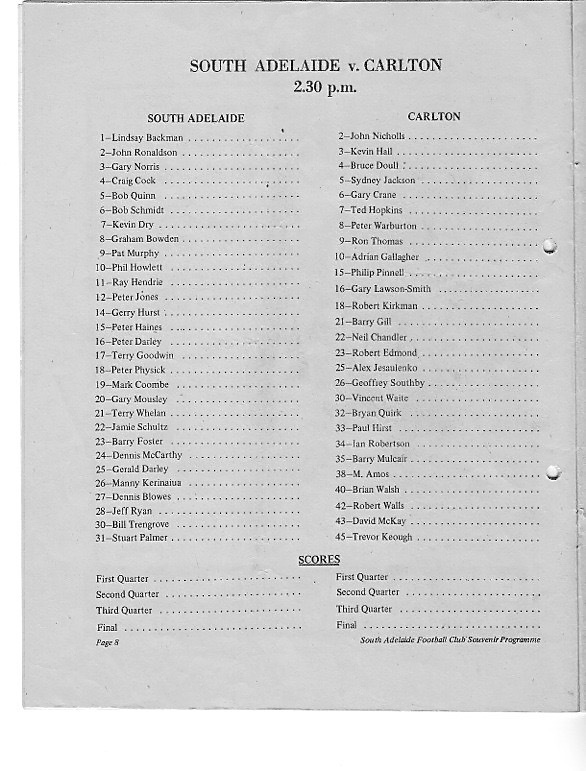 March 22nd 1971, South Adelaide V Carlton. Yes it did happen!!.. South a perenial cellar dwellar in the sanfl, took on the might of the reigning VFL premier.! The venue and the occasion was the official opening of Panther Park,St Marys. The ground was anticipated to be Souths new home ground after being a tenant at Adelaide Oval for the previous 80 years. Unfortunately as it turned out South never played a league match for points there, and the area soon after fell victim to League Boundary redistribution and Souths banishment to the distant southern suburbs where the club currently resides... next stop Parndana! I was a 12 year old at the time of this game, and lived in a street barely a good screw punt from the ground. I recall the anticipation leading up to the game as I was always present at Souths trainings, carting drinks and fetching footies from behind the goals. The crowd on the day was huge as I recall,it was pretty warm , standing room only as many punters were keen to see the Carlton side of the day in the flesh. South were coached by Jim Deane- one of the states greatest ever players and a dual Magarey medallist. South also had on their playing list Peter Darley, Lindsay Backman & Bob Schmidt - all state players. Terry Goodwin- father of current melbourne coach Simon was on a wing, Peter Haines ,father of current day Panther- Joe was at Centre Half Back. Mark Coombe and Stuie Palmer were also pretty handy players. John Ronaldson a former Richmond Ruckman was beginning his first season with South as well. While South had a reasonable side on paper, it was really a David vs Goliath battle when it came to the makeup of the Carlton side. Captain /Coach was John Nicholls - no CV required..went on to coach the Bays in latter years!! Syd Jackson was present -he went on to play at the Bays as well. Kevin Hall and the legendary Bruce Doull (the flying doormat) were handy defenders. Also in defence were Geoff Southby! and the very tough ,Vin Waite. Around the ball there were Adrian Gallagher , Percy Jones, Neil Chandler, Bryan Quirk,Ian Robertson and Phil Pinnell. ! Ted Hopkins also played..the hero of the Grand Final victory only a few months previous when he came on at halftime and booted 5 second half goals. I still have the program from the match and cant recall the exact final score but If memory serves me correctly, South went down by 8-9 goals...which really wasnt too bad an effort. Re: March 22nd 1971, South Adelaide V Carlton. I lived In Dorene street when I was a kid, blueandwhite, and went to a couple of events at South's "clubrooms" at the time in Pinn Street, St. Marys. Long time ago now! Great read, B & W.
Brings back some memories of great players. Lee wrote: Great read, B & W.
I lived in Tobruk Ave...quite close to the Dorene St intersection..!! one street north of Panther Park.